Bryce Harper put up another big number Saturday without taking another swing. Harper and the Washington Nationals reached a $21,625,000 deal for the 2018 season, a contact that gives him an $8 million raise and covers the slugging outfielder through his last year before he can become a free agent. 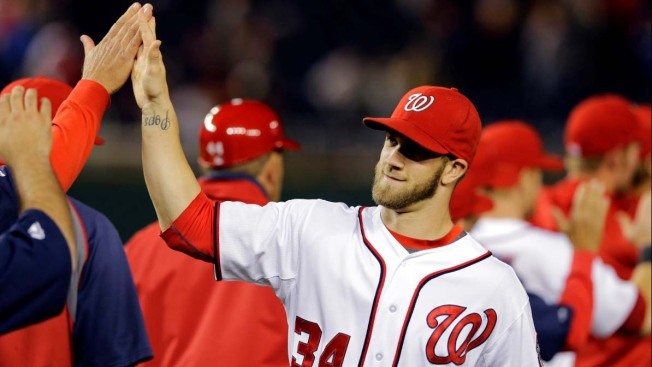 The 24-year-old Harper would have been eligible for salary arbitration next winter. The four-time All-Star was the unanimous NL MVP in 2015. "I think it's huge," Harper said, hours before the Nationals hosted Philadelphia. "We're able to go into the offseason and worry about different things. We're able as a team and an organization to go out and not have to worry about me going into arbitration for another year or anything like that." Harper is making $13,625,000 this season. After winning the MVP, Harper hit .243 with 24 home runs and 86 RBIs in 2016. This season, he is hitting .372 with 10 home runs and 29 RBIs in 31 games for the team with the best record in the National League. "I think it shows the comfort level Bryce has with the organization and that we have with him," Nationals general manager Mike Rizzo said. "It does a lot of good things for us. It gives us cost-certainty going into the season next year, and next year's payroll." "I think most important, there's a comfort level, a comfortable player that doesn't have to worry about discussing a contract next year," he said. Rizzo and Harper said discussions about the 2018 contract began last offseason as the parties negotiated ahead of the scheduled exchange of figures in arbitration on Jan 13. ``Couldn't get a two-year deal done at the time, but both sides always had open-mindedness of trying to put the five-plus arbitration season behind us,'' Rizzo said. In addition to his base salary, Harper can make $1 million for winning the 2018 NL MVP, $500,000 for finishing second in the voting, $250,000 for third, $150,000 for fourth and $100,000 for fifth. He also would get $100,000 each for being an All-Star or winning a Gold Glove or Silver Slugger award. Both Harper and Rizzo said the sides didn't discuss anything beyond 2018. ``I love walking into this clubhouse every single day and putting my Nationals uniform on and I'm going to enjoy this year and next year and not really worry about anything beyond that,'' Harper said.